The most basic unit of Salvation Army program services delivery is the neighborhood-based Salvation Army Corps Community Center. These facilities are our most direct link to the children, teens, adults, and elderly individuals and families within a community. 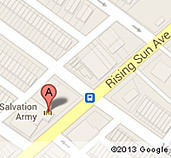 The Salvation Army Citadel Corps Community Center is neighborhood-focused and serves the entire Rising Sun community. Majors Zuniga, the leaders of the corps community center are called "corps commanding officers." They provide not only administrative leadership but are also considered the pastors of the center, which for many neighborhood residents is their church home. In keeping with The Salvation Army's mission to communicate the gospel of Jesus Christ and to promote the alleviation of human suffering, corps programs range from Sunday worship services, Bible Studies, and Vacation Bible School to crisis alleviation case management, substance abuse recovery groups, feeding programs, and child care centers. Other typical programs include after school enrichment programs, senior centers, character-building recreational programs, music instruction, summer day camp, leadership and life skills development, and much more. The Salvation Army is looking for people who will step forward to join in the peaceful, joyful fellowship of believers (in Jesus Christ) and the ongoing war against human suffering. If you are interested in attending, whether for church on Sunday or involvement during the week -- whether as a volunteer, curious visitor, participant or would-be soldier -- simply stop by. You are always warmly welcome.